Olive Rudd (vocals); Mick Hill (trumpet); Paul Gowland (tenor sax, soprano sax); Neville Hartley (trombone, vocals); Colin Haikney (keyboards); Alan Rudd (double bass); Tommy Graham (drums). Good Friday, the sun shone as if on a midsummer's day. 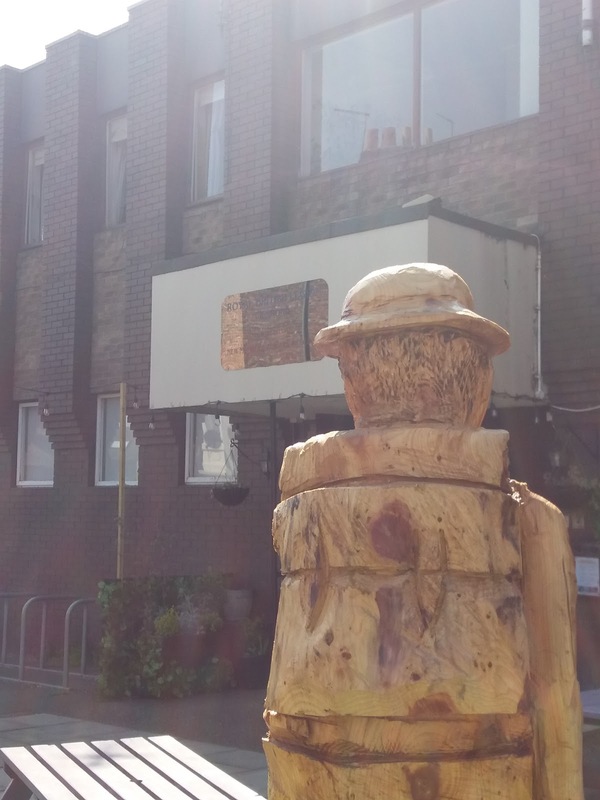 The Lonsdale looked a picture with its predominately student clientele basking in the sun in the pub's outdoor seating area. Turning into West Jesmond Avenue the British Legion Club's symbolic lone Tommy dutifully stood guard under a relentless sun. Inside, the split-level lounge was well populated with jazz-a-holics eschewing the sunshine in favour of their twice-monthly West Jesmond jazz fix courtesy of Classic Swing. Ten years ago Bebop Spoken Here's Editor in Chief couldn't have imagined that several thousand posts later the Tyneside-based jazz blog would win a national 'industry' award - Jazz Media category, 2018 All Party Parliamentary Jazz Appreciation Group - at a swanky 'do' in London. That was then, history, BSH has put it in a box, jazz moves on and so has BSH's hit counter, today clocking up three and three quarter million hits. The four million is on the horizon! Tom Cawley (keys); Gareth Lockrane (flutes); Fini Bearman (voice); Robin Mullarkey (bass); Chris Higginbottom (drums). One of those albums that kind of grows on you. I personally can live without synthesizers - like coffee creams they are ok in moderation - but a box/album full of them can be too much. However, despite the heavy electronica, there is still much to like. Lockrane's superb fluting's proof that, in the western world, he reigns supreme. The voice sounds of Bearman meld in well. By some mystical Hogwartian means, the singer is also a choir! 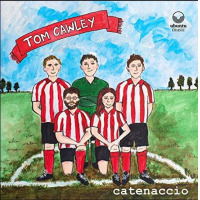 Cawley expertly manipulates the dials and the thingamajigs but the best moments for me are when he plays piano unplugged to the light bulb. DJazz: Durham City Jazz Festival is three! Its inaugural weekend in June 2017 was an unqualified success, its second year equally so and there is no reason to think this year's event will be anything other than a runaway success. 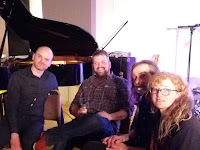 DJazz 2019 (June 7-9) organised a launch event in the Courtyard Cafe housed within Palace Green Library, Durham University. The Courtyard Cafe boasts views of the adjacent Durham Cathedral. There can't be many jazz venues situated next to a UNESCO World Heritage Site! DJazz masterminds Carlo, Heather and Nick were on hand to meet and greet and, crucially, orchestrate the 'big reveal' - this year's headline act. 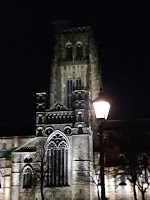 A bottle of Durham Brewery's Magus (with its sober 'ecclesiastical' label design), a tempting chocolate brownie resisted, the full house listened with bated breath as the DJazz team said a few words about this year's festival. 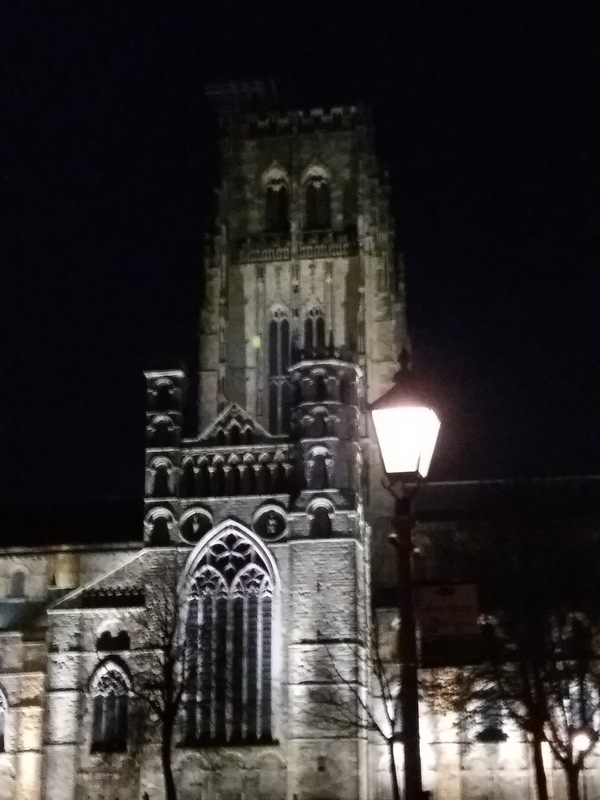 By design, new venues would be utilised - ranging from the wonderfully named, intimate HolyGrAle beer bottle shop to the majesty of Durham Cathedral - and new names (new names to DJazz) would be added to the bill. A big plus this year is the re-siting of the DJazz Festival Hub from Fowler's Yard to the recently redeveloped Riverwalk site with its profusion of eateries and liquid refreshment establishments. Joseph Carville (piano); Alan Peat (bass); Mark Rayner (drums) + > David "Showtime" Gray (trombone). 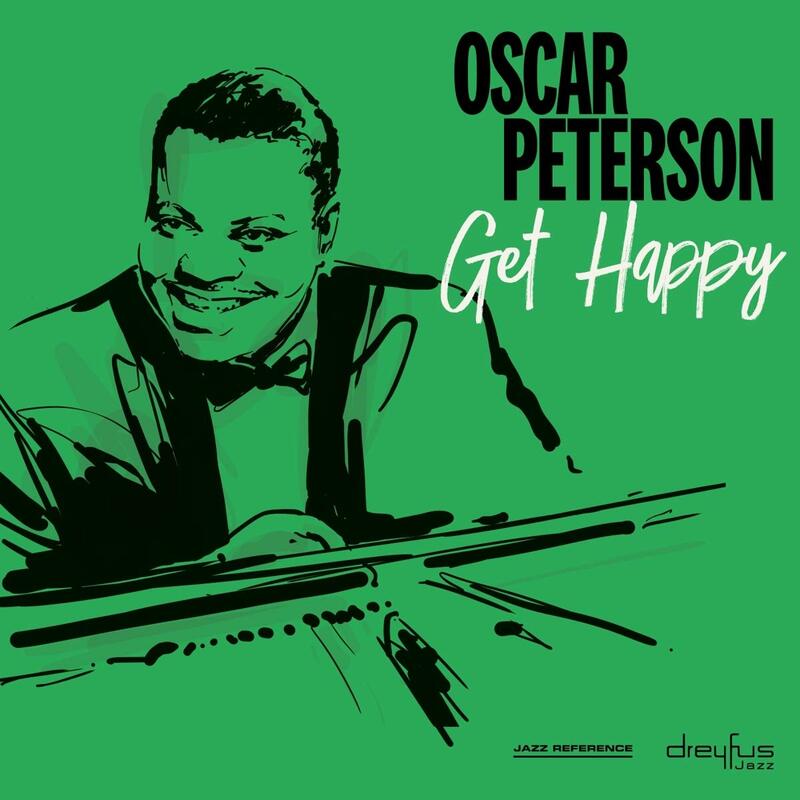 This excellent young pianist is little known in the local jazz scene, having played relatively few public gigs, but hopefully will start to receive the attention he deserves. The gig was scarcely publicised, held at a venue that hosts few (but often very good) jazz performances. The audience consisted mostly of a solid core of followers of the band. How do we judge jazz performers? By the originality of what they play, by doing something different; by technical brilliance; by sensitive harmonies, by emotion; by surprising us. James Romaine (alto sax); Asaph Tal (double bass); Kai Chareunsy (drums). There was no shortage of choice with gigs on Tyne, Tees and Wear - Newcastle alone had three tempting sessions - so BSH's resources were fully stretched. After much deliberation, I opted for the JR Trio from that hotbed of jazz the Birmingham Conservatoire. I suspected that this pianoless/guitarless trio of young musicians would unleash a sack of 'originals' of the "I wrote this one on the top deck of a bus after I'd split up with my girlfriend" variety. I would classify this music as soul-influenced, so perhaps it should have been reviewed by Steve T, whose long discussions with Lance about CDs and ‘vinyls’ I’ve enjoyed immensely. (I’m with you Steve, CD’s are the best invention since music itself*). 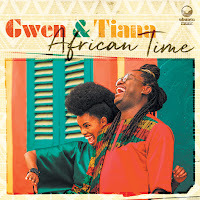 This is happy party-style music, wise lyrics reflecting on life, with clapping, duets, short, snappy solos, fine playing. 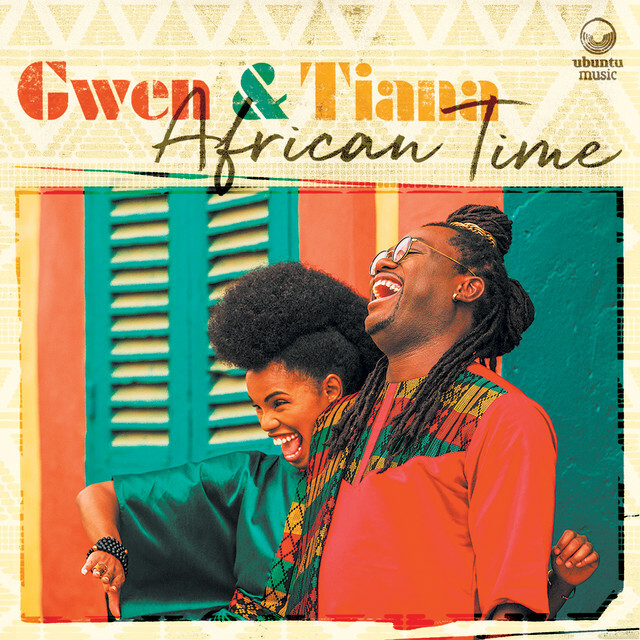 Right through from the start African Time, (a clever double meaning to introduce African-influenced songs), many with what I believe to be a ‘township’ feel. All the songs are original except for Yesterday. Triptych booked two nights at Blank Studios to record material for a forthcoming CD release and, what's more, thought it a good idea to do so in front of an audience. This second evening on Warwick Street just east of Newcastle city centre drew a supportive crowd there to listen to the trio and, as a bonus, observe artist Lisa Delarny as she responded to the music creating real-time visuals projected onto a screen. 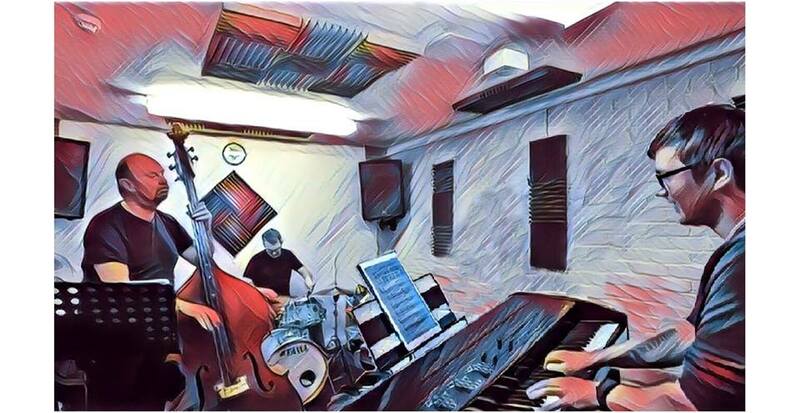 The word is that ace drummer and occasional actress Abbie Finn has joined local hard bop band Alter Ego replacing David Francis who is to concentrate on his free-lance connections, teaching and extra-music activities. The band is currently open for gigs. I'm in deep trouble - I have a pile of current releases awaiting review but how, in all honesty, can I give them preference over this? 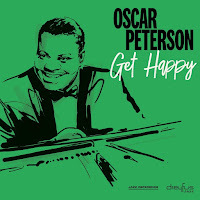 Oscar Peterson is my undisputed jazz keyboard king. Art Tatum was great but, wonderful as he was, he didn't quite swing the way Oscar did - ask any drummer who played with him! Nor did Tatum explore harmony the way Peterson did. Admittedly, in later years, he [Peterson] became a predictable machine but when these recordings were made (1949/50) he was close to his peak even though it was early days. Ben Gilbert (keys); Paul Grainger (bass); Russ Morgan (drums) + Harry Keeble (tenor sax); Lachlan Fotheringham (soprano sax); John Pope, Dave Parker (bass); Walter Feeney (trumpet); Abbie Finn, Matt Fairhurst (drums); Debra Milne (vocals); Poppy Pagan (vocals/flute). Some 11 years ago, when BSH was first launched into cyberspace, much of the action took place down on Newcastle's quayside at the Side Café. One of the many emerging talents from that era was pianist Ben Gilbert whose flame flickered brightly and briefly before disappearing and turning to [the] Smoke. Now based in Leeds, he heeded the call to Graingertown for the highly esteemed Black Swan jam session where he displayed the maturity we all knew would blossom.